Local Recording allows you to record your presentation offline. You will be able to set the quality of your recordings, which codecs are used for encoding as well as split the output into multiple files. 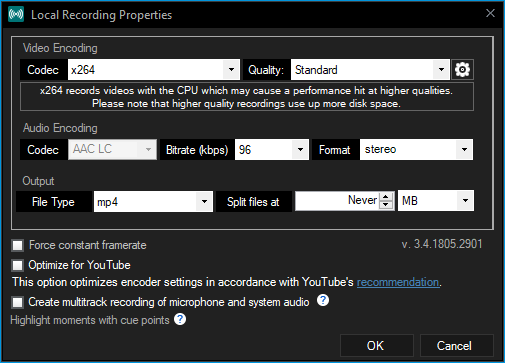 Options to optimize your recordings for YouTube and enabling multitrack audio are available as well. Go to Record, then right-click on Local Recording or click the gear icon next to it to open the Local Recording Properties. Go to Record then click on Local recording. 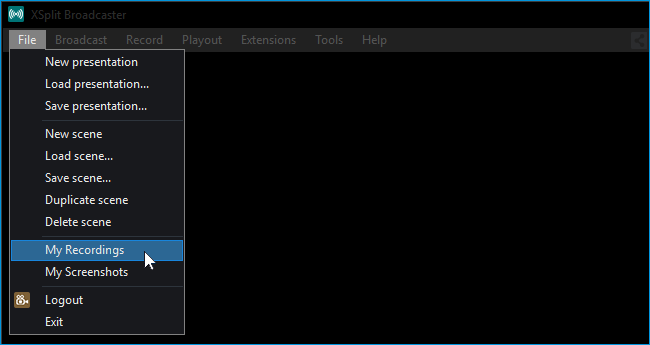 The local recording's status will be displayed on top of the XSplit Broadcaster window once it has started. The Record menu will also be displayed in red. To stop your recording, go to Record then click on Stop local recording. The Pause local recording option will appear as well under Record while a local recording is active. To locate your recordings, go to File > My Recordings. The My Local Files window will pop up after. To learn how to manage your local recordings, click here. Set the codec how your video is processed using either standard x264 (CPU) or GPU codec depending on which hardware is installed. NVENC H.264 for NVidia, VCE for AMD, QuickSync for Intel, and Avermedia’s H.264). Set the quality of your local recording to whether standard, high, very high, ultra high, or custom. Choosing higher quality may require better CPU or GPU resources. Set the audio bitrate to whether 96 kbps or higher. Choosing higher bitrate produces better and clearer sound quality of your recordings. Bitrates higher than 96kbps is only available on Premium license. Set the format of your local recording’s audio channel to either stereo or mono. Stereo format option is only available on Premium license. Set the video output file type to either FLV or MP4. Enable your recording to be split into parts according to minutes or file size. It allows you to easily manage your files and shorten the time to process your videos. This option is only available when MP4 is set as your video output file type. Allows your local recordings to be compatible with various video editing software with different framerate standards. This option is enabled by default. Allows you to optimize your local recording’s encoder settings based on YouTube’s recommendation. Allows your local recording to encode separate tracks (system sound, microphone, stream only) in your video file. To learn more about Multitrack Audio recording, click here.